We love little bits of food trivia that help us make better choices. Here are five tidbits from nutrition Madison Linek, RDN, LD, a clinical dietician with Kroger Health (Kroger is America’s largest supermarket chain). Avocado. Some people go by a slight squeeze with the fingers, but you can find the perfectly ripe avocado by checking the color of the stem end. If it’s green, it is ready to eat. Any lighter, it’s not ripe enough and the more brown, it’s overripe. You probably know this trick about browning: To keep the cut surface of the avocado from browning quickly, leave the seed in, squeeze some lemon juice over the flesh and tightly wrap the surface in plastic wrap to prevent air from getting in. Bell Peppers. In all the years of eating bell peppers, we never noticed that some have three sections on the bottom, and some have four. The peppers with three sections on the bottom are better for eating raw (e.g. crudités, salads) since they are sweeter. Those with four sections are better for cooking, where sweetness doesn’t matter as much. But of course, when selecting peppers, you can look for three sections for every use and bypass the four sections. Eggplant. Do you want a less bitter eggplant? Look at the bottom for a more oval shape. These are the males, and they’re less bitter than the females, which have a more round bottom! Male and female eggplants? Who knew? Pomegranates. If you need pomegranate arils but can’t find them prepackaged, here’s how to remove them from the fruit with less mess. Cut the pomegranate into quarters and place them in a bowl half full with water. Keeping the fruit in the water, peel the seeds out of the fruit. Strain them from the water and you’re ready to go. Potatoes. To keep potatoes from sprouting, throw an apple or two in with them. The gasses the apples emit—ethylene, carbon dioxide and oxygen—will prevent potato sprouts. The top and middle eggplants male and sweeter. 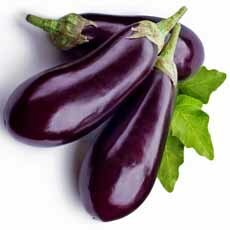 The bottom eggplant is female and more bitter (photo courtesy ItDelice.com). 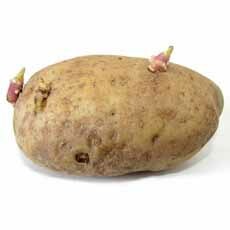 An apple will protect your potatoes from sprouting (photo courtesy Alberton Record).